Bongos is an excellent indoor soft play centre with an exciting variety of equipment to keep kids entertained from toddlers, with our dedicated framed systems, ball pool, soft play and car track area to our Fab 3-Tiered system complete with spooky maze, ball cannons, spiral slide, dizzy discs and slides to name but a few for the more adventurous! Come and visit our Playbarn and Cafe - our soft play zone caters for children up to 11 years old! Let the kids run around and burn off some energy in our playframe, while you relax on our comfy couches and chairs, even browse the internet with our free Wifi. The 5 star British Golf Museum sits at the heart of the home of golf, just 67 yards from the famous Old Course. Imaginative exhibitions, hands on activities and stunning multimedia displays bring to life over 500 years of golfing history. The British Golf Museum is the world’s premier heritage centre for golf. The ceramic experience is an award-winning visitor attraction and ceramic painting studio minutes from Dunfermline town centre and close to the M90 motorway. At the studio, customers are supplied with everything from stamps and stencils to aprons, brushes, tiles and paint, all of which are non-toxic and food safe. East Sands offers a great day out for all the family, with it's freeform leisure pool with sloping beach area, tropical palms, giant flume and aqua run inflatable. Other facilities include: squash courts, gym, snooker and pool, steam room, spa bath and a cafe. FIPRE comprises of a complex of indoor and outdoor facilities providing sport from fun beginner's classes to international standards. Facilities include swimming pools, sauna, games hall, gym, squash courts, athletics track, grass, astroturf and al l weather pitches. A long beach, stretching some 2,141 linear metres, which has private amusement arcades; kiddies rides; summer fair; putting green, crazy golf and skateboard ramp. Muddy Boots is essentially a farm shop but they've made the effort to make it a trip rather than a chore. As well as a large cafe with kids' menu there is children's entertainment in the form of a tractor track / quad train, a large jumping pillow, gyro cars, grass sledging, turf boarding and indoor and outdoor play areas! Playzone (formerly Koko's) has been refurbished. We now have a new coffee shop which is open to the public and not just those at laser or soft play. We have three play areas: Children aged 5 to 12 years Children under 5 years Babies and toddlers under 3 years The equipment includes ball pools, soft slides, cargo netting, balance beams, wavy walks, aerial glides, log climbs, stepping stones, full length astro slide and much more!! Welcome to the outstanding Scottish county of Fife. If you need child friendly ideas where to take the kids, kids days out, or fun things to do with the kids in Fife then we can help. We have family pubs with kids play areas, soft play areas, indoor play areas, outdoor play areas, playgrounds, aquariums, castles, stately homes, children's clubs such as Scouts, Cubs, Beavers, Brownies, Guides, youth clubs, activity centres, Air, Sea, Army Cadets. We list children's entertainers in Fife if you are planning a birthday, cinema, theatre, petting zoo, animal farms, children's farms, leisure hire, museum and art gallery, nature areas such as parks, and countryside walks and beaches. We have kids activities related to outdoor pursuits and sports such as swimming, ice skating, ten pin bowling and football centres. We list theme parks and Adventure Parks in Fife. If you are looking for zoos with more exotic animals then we have them. Don't forget to look at the nearby counties of Central and Tayside to see what they can offer you. We have days out with the kids in Fife in and near :- Abercrombie, Aberdour, Annfield Muir, Anstrutheir, Arncroach, Auchterderran, Buckhaven, Cowdenbeath, Dunfermline, Gartyne, Glenrothes, Kirkcaldy, Methil, Rosyth, St. Andrews. Fife is a council area of Scotland, situated between the Firth of Tay and the Firth of Forth, with landward boundaries to Perth and Kinross and Clackmannanshire. It was originally one of the Pictish kingdoms, known as Fib, and is still commonly known as the Kingdom of Fife within Scotland. It is a lieutenancy area, and was a county of Scotland until 1975. It was very occasionally known by the anglification Fifeshire in old documents and maps compiled by English cartographers and authors. A person from Fife is known as a Fifer. 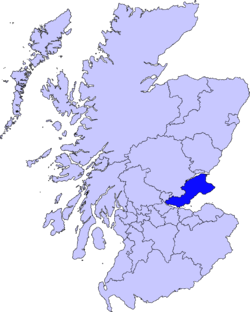 From 1975 to 1996 Fife was a local government region divided into three districts — Dunfermline, Kirkcaldy and North-East Fife. Since 1996 the functions of the district councils have been exercised by the unitary Fife Council. Fife is Scotland's 3rd largest local authority area with a resident population of just over 350,000. Almost a third of the population live in the three principal towns of Dunfermline, Kirkcaldy and Glenrothes. The historical town of St Andrews is located on the east coast of Fife. It is well known for one of the most ancient universities in Europe, and as the home of golf.